PowerPoint 2003 has a nice feature that creates a summary, or agenda, slide automatically from all the slides in the presentation. But did you know that you can choose which slides from the presentation appear on the summary slide? To create a summary slide from all the slides in the presentation, display the slide in front of which you want to place the summary slide. For example, if you want it to be the first slide, select the slide that is currently first. Then press Ctrl+A to select all the slides in the presentation, or choose Edit > Select All. Finally, click the Summary Slide button on the Outlining toolbar. Switch to slide sorter view (View > Slide Sorter). Select the slides that you want to include. To select individual slides, click the first slide, then press Ctrl as you click additional slides. Click the Summary Slide button on the Slide Sorter toolbar. The summary slide appears in front of the first slide that you selected. (You can move it of course.) Only the slides that you selected are listed. 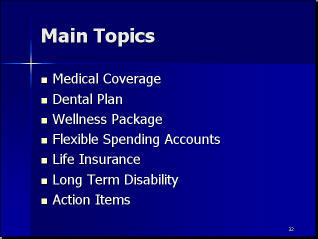 This summary slide includes only the main topics of a rather long presentation. Hyperlink each item (Insert > Hyperlink) back to its slide. When someone asks a question on one of the topics, you can quickly go back to the slide and review it as part of your answer. 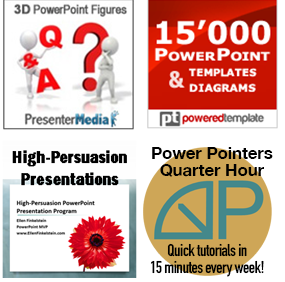 Be sure to have hyperlinks on these slides that go to the question slide or use the slide show view’s right-click menu. Update: Unfortunately, the Summary Slide feature doesn’t exist in 2007 and later. love your blog, it has helped me a lot. I came across this older article about titles for a summary slide. I tried to create this in ppt 2010, but cannot find the summary button. Could you help me find this? Or give an update on your article of June 6th, 2001? Mike, Thanks for your kind comments about my blog. Unfortunately, that feature no longer exists. You have to create a new slide using the Title and Content layout and then copy and paste each slide title into that new slide. I know, lots of work! I’m sure someone could write some VBA code to do this. I’ll ask around. Optionally you can insert hyperlinks or use the new section names feature in PowerPoint 2010, as summary items.